This wasn’t your typical store robbery. 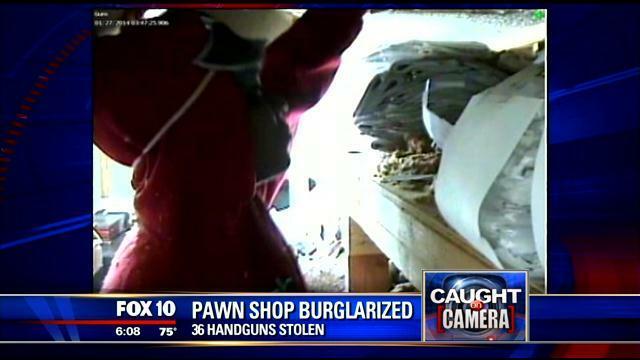 Two crooks stole 36 guns after breaking through the roof of a Phoenix pawn shop, Myfoxphoenix.com reports. Concerned about where those guns are going, the ATF is offering a reward. The thieves only swiped handguns. “They have to acquire guns. Certainly the U.S. is no stranger, the south-west border in particular, for being a gun locker if your will being able to obtain guns here through the secondary market. Though illegally purchasing guns and also stealing guns.” said Tim Mangan with ATF. Posted: 1/31/14 at 9:32 AM under News Story.